Sadly our dear Diagnosed has stepped down as Moderator. :bunnycry:Please read on if you'd be so kind as to consider a moderator role. Moderators are an important position on any forum. They are needed to keep track of sections, boost activity, make sure all members are following the rules and also lead with an example of exemplary behavior. There are many sections to GC and each one needs to be watched and cared for if it is to thrive. Below is a list of our sections and which ones are open. * Must have been a member for at LEAST one week - so we can get to know you. 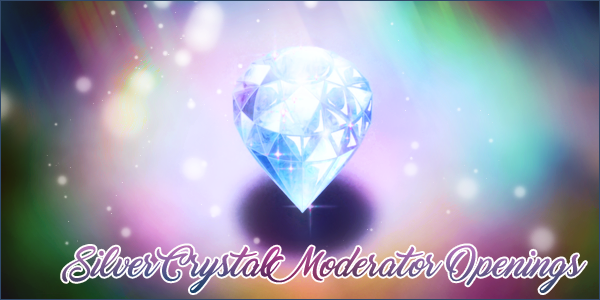 * If and when a moderator application is accepted, that new moderator will begin a month long "probation/trial" period to ensure they are a good fit for the forums and the community, along with a training activity. If the Moderator does not live up to their duties and our expectations, we reserve the right to let go of said Moderator at any time. We also reserve the right to lengthen or shorten this time on a case by case bases if necessary. * Admin are subject to changing, adding, or eliminating these rules at any time. Be able to commit at least 1 to 2 hours a day to the site. Some sections may require more time than listed here, so be prepared for that. Maintain and keep activity in your section, as well as helping around the site as much as possible. Interact and be personable with members. You are often the first person of contact for questions and situations so it is important to make yourself available and open to any and all members. Lead by example with maturity. Maintain an unbiased approach to every situation, or be aware enough that if you are unable to do so that you need to pass it on to an Admin. Be able to answer PMs about the site and Sailor Moon. Make announcements and keep up to date on projects and the sections you are in charge of. Please copy and paste the following code for the application. Be mindful of your formatting when you do so. It needs to be legible and have any messed up code or odd font colors. All questions are required and must be filled out or your application will be rejected. [b]If yes, do/did you have experience as staff on any of them? [b]Tell us about yourself (so we can get to know you better) and how you feel you fit in on the forums. [b]List the top 3 sections you would prefer to mod in order of your favorite one first. Please be aware that while filling out these applications, you should do so as professionally as possible. Consider it like applying for a job in real life. While this may be an internet forum, we do take these applications seriously and the manner in which you fill these out greatly affects our decision on the application. The Writers & RP Guild has a wonderful Resume and Staff Application that could provide tips and advice for apply! Applications Close April 19th 12pm EST.